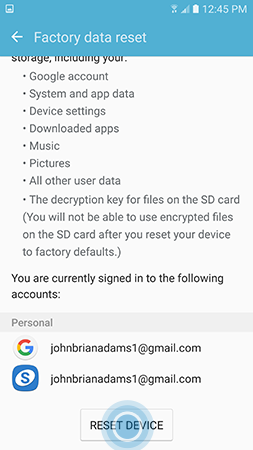 A factory data reset will erase all personal data from your device, including downloaded applications, music, and pictures. Your personal information cannot be recovered, so save any information you need to your computer before following these steps. Note: The provided information refers to the devices sold in Canada. 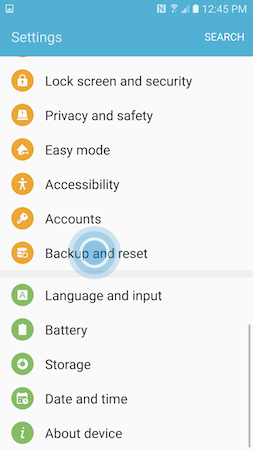 Screens and settings available may vary depending on your Canadian wireless service provider and your software version (Android 6.0 Marshmallow was used for this FAQ). Warning: All of your personal information and downloaded applications will be erased and cannot be recovered. 1 From the Home screen, tap Apps > Settings. 2 Scroll down and tap Backup and reset. 3 Scroll down and tap Factory data reset. 4 Review the information provided and touch RESET DEVICE. Note: If you have a screen lock enabled on the device, you will be required to enter your credentials before proceeding. 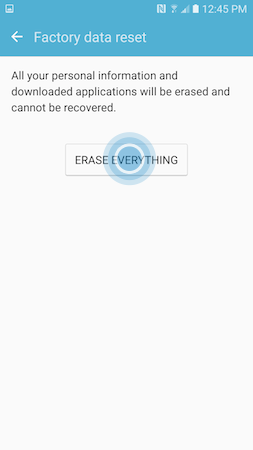 5 Tap ERASE EVERYTHING to restore device to it's default factory settings. 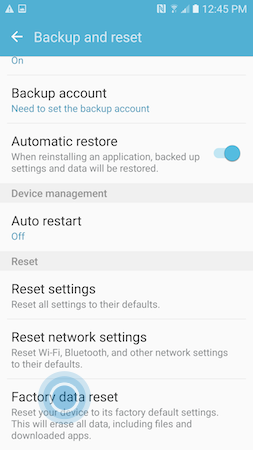 Note: If a Samsung account was setup, you will be prompted to enter your account information to proceed factory reset. Tap CONFIRM to proceed. How do I use the USB Connector to connect my Galaxy S7 to my previous device?